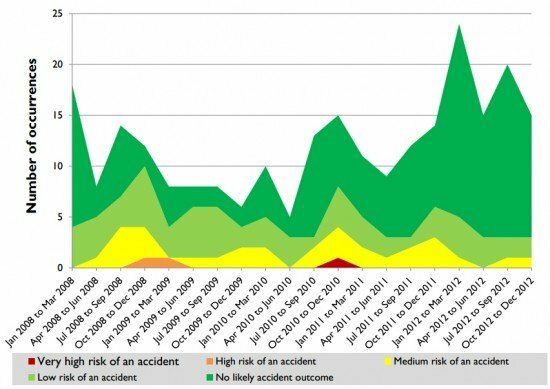 Assessed risk of stall warning occurrences reported to the ATSB, 2008 to 2012. The Australian Transport Safety Bureau (ATSB) released a research report into 245 stall warning events on Australian airliners. Transport Safety Investigation Regulations require that, if a pilot receives a stall warning, they must report it to the ATSB. There were 245 stall warnings reported to the ATSB in high-capacity air transport in Australia in the five years between 2008 and 2012. A review of these 245 stall warnings showed that almost all were low risk events which were momentary in duration, and were responded to promptly and effectively by the flight crew. No occurrences resulted in a stall or an irrecoverable loss of aircraft control, and only a few were associated with minor injuries to passengers or crew (generally those that occurred in severe turbulence) or a temporary control issue. Stall warnings, and in particular stick shaker activations, were well reported by Australian air transport operators, and occurred in a range of flight phases and aircraft configurations, not exclusively those related to low speed, high pitch attitude flight, or flight in poor meteorological conditions. Fifty-five per cent occurred in visual (VMC) conditions, and those in instrument (IMC) conditions mostly occurred in cruise. In typical stall warning events during cruise, the aircraft was operating at an altitude where there was a narrow band (about 20 knots) between the maximum operating speed and the stall warning speed. Common precursors to these events were rapid changes of pitch angle or airspeed. In about one-fifth of these occurrences, the stall warning system was activated when the autopilot tried to correct the aircraft’s speed or flight path due to a disturbance. Stall warnings during VMC flight were most common on approach, often involving aircraft being affected by turbulence while manoeuvring around weather. The ATSB identified 33 serious and higher risk incidents in which a stall warning occurred. The majority of these involved brief stick shaker activations, and were associated with moderate or severe turbulence. Most happened on approach to land, when aircraft were in a low speed, high angle of attack configuration, and in several cases the stall warning speed was higher than normal due to a higher wing loading (g) factor in a turn, or an incorrect reference speed switch setting. In these cases, the risk of a stall developing was increased by a lack of awareness of decreasing airspeed and increasing angle of attack prior to the stall warning, and/or an approach to land where the flight crew were focused on trying to correct the approach prior to the stabilised approach height instead of conducting a go-around.